Shannon Bassett’s research, teaching, writing and practice operate at the intersection of architecture, urban design and landscape ecology. Her writing on both China’s explosive urbanization and its changing landscape, as well as shrinking cities and the post-industrial landscape in North America, has been published in Topos, Urban Flux and Landscape Architecture Frontiers Magazine (LAF) and Canadian Architect. 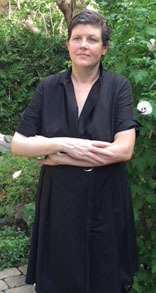 Her design research and work has been exhibited both nationally, as well as internationally, including at the Hong Kong Shenzhen Bi-City Biennale of Urbanism and Architecture (2012) and was featured in the ensuing book publication, “Learning from Tri-ciprocal Cities: The time, the place, the people”. It has also been displayed at the BUGAIK International Architectural Exhibition (Busan Ulsan Gyeongnam Chapter of Architectural Institute of Korea). She was awarded a National Endowment for the Arts grant for (Re)Stitch Tampa. Ensuing from this research platform was the publication, “(Re)Stitch Tampa: Designing the Post-War Coastal American City through Ecologies.” Her design practice has included designing an urban design masterplan and study for an urban artist colony on a 42-acre site, the Village of the Arts in Bradenton, Florida, as well as a series of speculative design studies for the City of Tampa Riverwalk for the City of Tampa. Shannon has taught in Buffalo, Tampa and at Wentworth Institute of Technology in Boston. She has practiced architecture at award-winning practices in Boston and Ottawa. With the National Capital Commission in Ottawa she was also a junior architect for the Official Residences Section and a junior urban planner for the Long-Range Planning Division for community outreach on several high profile urban design projects, including the LeBreton Flats Redevelopment. She has lectured internationally, as well as run design research studios in China, collaborating with the Tongj College of Architecture and Urban Planning, the Tianjin School of Architecture, and the Turenscape College of Architecture and Landscape Architecture, Peking University in both Beijing and Anhui province, with a focus on rural urbanism of Village planning or “rurbanism”. She served as an elected two-term board member of the International Association of China Planning (IACP) from 2011 to 2015.